Apple pie.This dessert is an absolute favorite for those rainy evenings when you want to enjoy a dessert and tea at home, while watching your favorite television show. You can have it hot or cold, and both ways it is delicious! 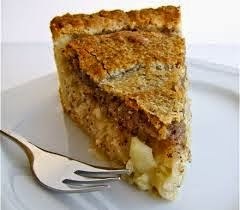 A crossover between a pie and a cake, it is crumbly and moist at the same time. Mix the dry ingredients (flour, semolina, baking powder, salt and cinnamon) in a bowl. In another bowl mix the beaten egg, vanilla, sugar, and apple and butter. Add the flour mixture to the egg & apple mix. Stir to a very thick batter. If it is really thick add a teaspoon of mil to bring it to a runny dough consistency. Note: the cake mix should be of an almost dough like consistency, and unlike cakes, should not be batter like. Pour the dough into a cake tin, and sprinkle with raisins and cashew nuts. Bake at 175 C for 35 to 40 minutes.